So, What About Other Seafood? One of the commonest questions that pregnant women ask during their pregnancy is “What is safe to eat when expecting a baby?” There are a number of favorite foods of women and it is natural that they want to continue enjoying them even when they are expecting. Oysters, sushi and other seafood items are among the few foods that most women want to eat during their pregnancy. So, what about shrimp? Can you eat shrimp while pregnant? The answer to "can you eat shrimp while pregnant" question is YES. 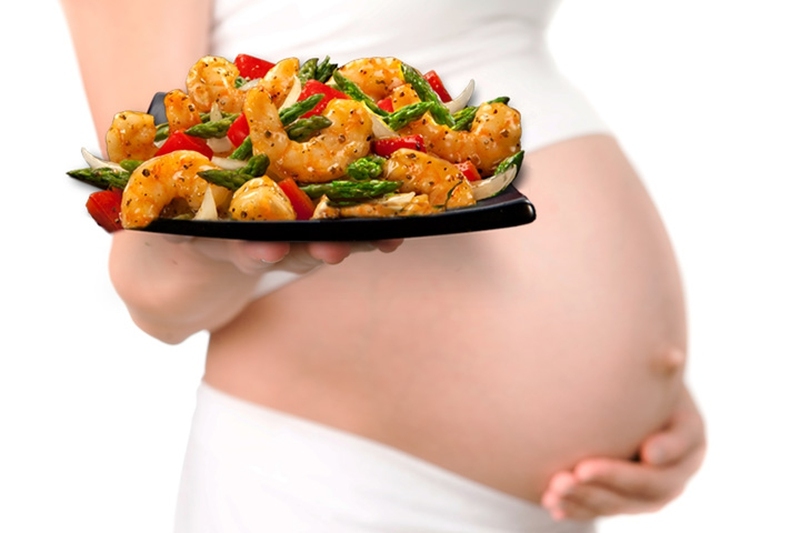 There are few restrictions on enjoying shrimp during your pregnancy. Since they are rich in protein, they are massively helpful in the normal development of the baby. Moreover, they are a good source of iron too, which women need in abundance during their pregnancy. Shrimp contains omega-3 fatty acids as well which are required for the development of the brain of the baby. Women eating a steady amount of shrimp and other seafood have less of a chance of having premature delivery. However, monitoring the intake of shrimp is extremely important. FDA and EPA recommendations suggest that pregnant women can eat up to 12 oz. or 340 grams of shrimp per week if they have been cleaned and cooked properly. It is recommended to monitor shrimp intake because eating shrimp while pregnant entails the risk of mercury poisoning as mercury is present in shrimp. Consuming too much shrimp can damage the nervous tissue development in the baby and may lead to birth defects or even a still birth. This is why it is important to restrict the shrimp meals to twice a week. The guidelines above set by the FDA and EPA regarding the consumption of seafood must be strictly followed and every effort must be made to eat only seafood that does not contain large amounts of mercury. Note: The mercury levels of the shrimp depend upon where it was caught. Information pertaining to the mercury levels in the waters in your area can be obtained from the community health department if you want to enjoy shellfish that has been caught locally. It is important to remember that the top priority is ensuring that the shrimp has been completely cooked before eating. After knowing all the related information about eating shrimp while pregnant, here is a delicious shrimp recipe that you can enjoy. However, there are seafood items that contain less mercury and are thus safe to eat. According to the recommendations of the 2010 Dietary Guidelines for Americans, eating two average meals which equates to 8 to 12 ounces of seafood below per week is safe for pregnant women. The tuna steak and albacore tune must be restricted to 6 ounces per week. It is important to know that the level of mercury is each can of canned light tuna is different. Some researchers disagree with the limits of seafood consumption mentioned above. They cite the study which suggests that even if women consume seafood more than what is approved by the FDA, they are not going to suffer any side effects. No matter what kind of seafood you are going to enjoy, here are some precautions you must keep in mind for avoiding harmful bacteria or viruses in it. Sashimi, clams, sushi, raw oysters and scallops are some examples. Seafood labeled lox, jerky, smoked, kippered or nova style is included in this category. Eating smoked seafood is allowed if it is only used as an ingredient in a cooked dish or casserole. It is also safe to eat shelf-stable or canned versions of smoked seafood. Local fish advisories are important when eating locally caught fish, especially if there is a concern about water pollution. In case no advice is available, do not eat more than 170 grams of locally caught fish per week. Fish must be cooked to an internal temperature of 63 C. When the fish appears to be opaque and separates into flakes, it is considered cooked. Shrimp, scallops and lobsters must be cooked until they are milky white. Mussels, oysters and clams must be cooked until their shells open up.